Choosing to ride a bike instead of driving a car doesn’t mean you have to forego the convenience of a camper trailer – if you’ve got the leg muscles to pull it off. 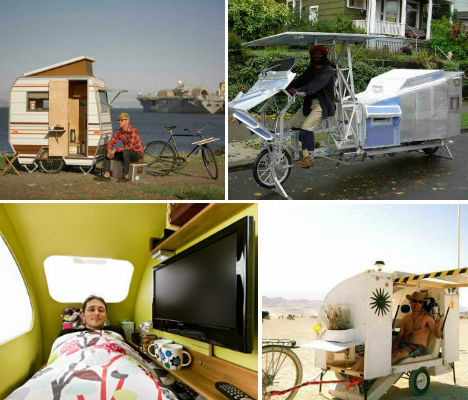 From prototypes by a major German RV manufacturer to impressively innovative DIY creations, these 12 miniature mobile homes for bicycles pack lots of function into small (and not-so-small) trailers that don’t require gas or electricity to transport. 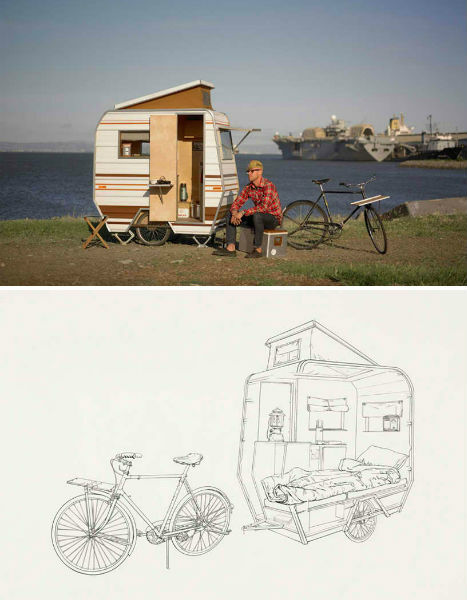 This amazing bike camper by Kevin Cyr looks exactly like a standard car camper, down to the smallest details like faux wood siding, reflectors and power inlets. For Cyr the camper is more sculptural art piece than functional recreational item, but he has definitely proven its viability by cruising it all over various cities. 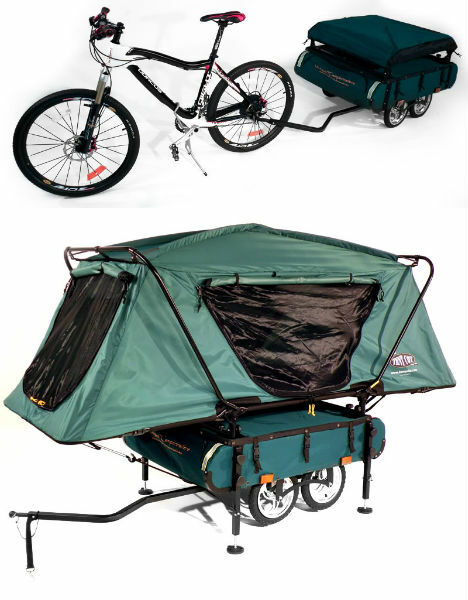 Available at Kamp-Rite, the Midget BUSHTREKKA is a lightweight bike trailer built for uneven terrain. It features three main storage compartments with over 41 gallons of storage space and fully adjustable leveling jacks. 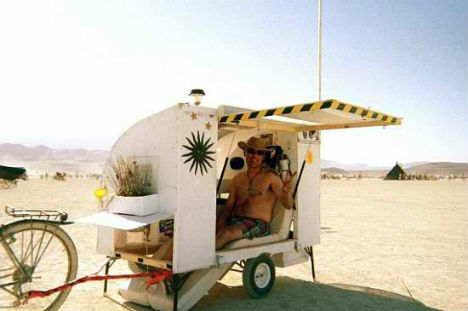 The trailer pairs with the ‘TentCot‘ to create the camper setup pictured. The adaptable ‘Room Room’ by Encore Heureux + G Studio for ‘Crossing: Dialogues for Emergency Architecture’ Exhibition in China can be pulled by bicycle, motorcycle, donkey or on foot. 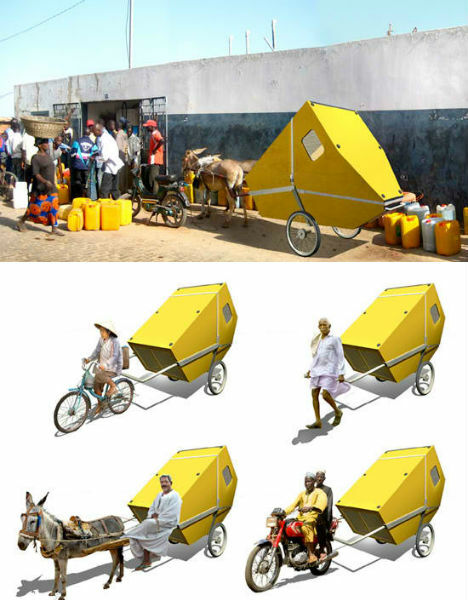 Conceived as a mobile shelter for post-disaster recovery, the shelter can be picked up and hauled on its wheels, set back for sleeping or turned on its head and extended with a tent for longer-term use. Built for Burning Man, this camper weighs 100 pounds and is packed with a solar oven and a solar water heating system, and has a wind turbine and solar lights on the exterior. 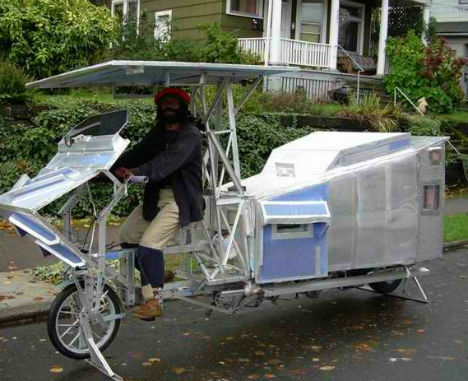 Spotted in Portland, this DIY bike camper was inspired by moon rovers and the moon landing vehicle. 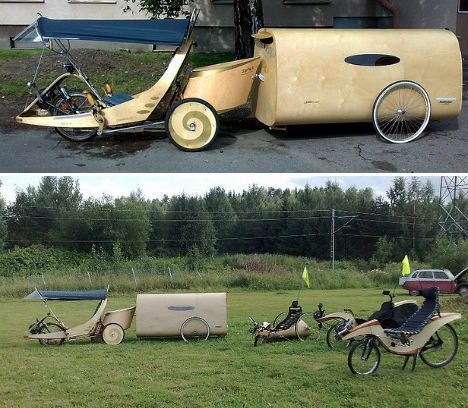 Finish designer Sakari Holma built this minimalist wood bike camper trailer, which is just wide enough to lay down in to ensure that the design is streamlined enough to pull without too much effort. 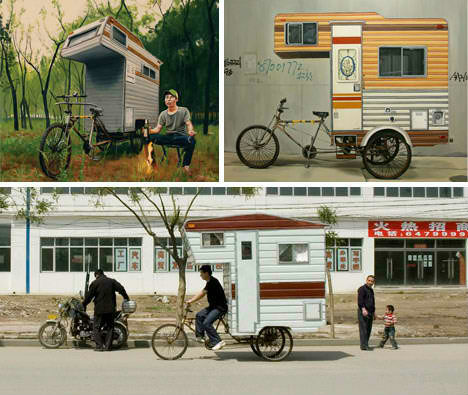 The ‘Little Tag Along’ camper is another design by Kevin Cyr, with the look of a conventional camper shrunk down to bike-size. Pulled by a vintage 3-speed bicycle, Little Tag Along contains the minimum that you’d need to hunker down for the night on a regular basis – just a bed and a little bit of storage space. 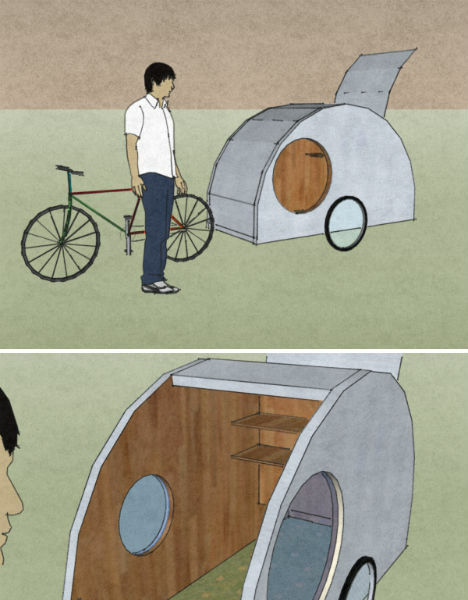 Michael Janzen of Tiny House Design envisions a lightweight teardrop trailer for bikes in this concept illustration, pointing out that a company called Human Powered Machines makes bike trailers that can carry up to 500 pounds. Of course, whether the person riding the bicycle can tow that much is another question. 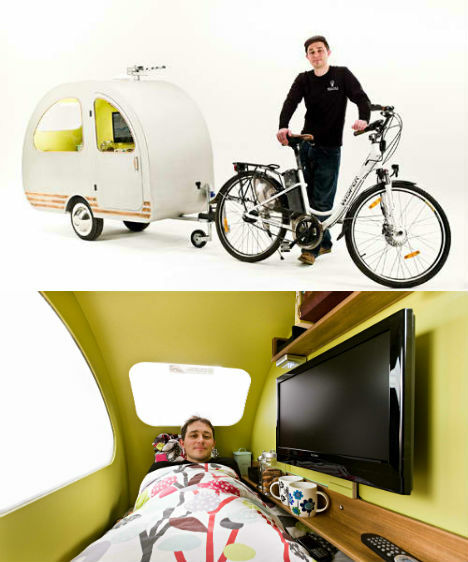 This tiny lightweight bike caravan is fancier inside than you’d expect: it fits a twin bed, a 19″ flat-screen television, an electric kettle for tea and a ‘drinks cabinet’. Optional extras include solar roof panels, a satellite dish, a gaming console, central heating and an external luggage rack. 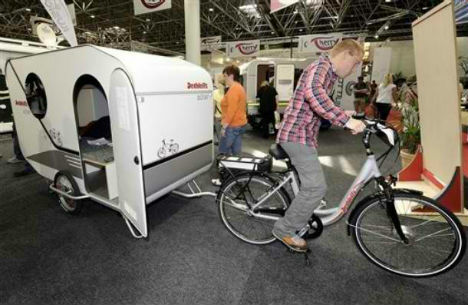 German RV maker Dethleffs experimented with a concept bike camper, producing a prototype that included a bed and a small kitchen. 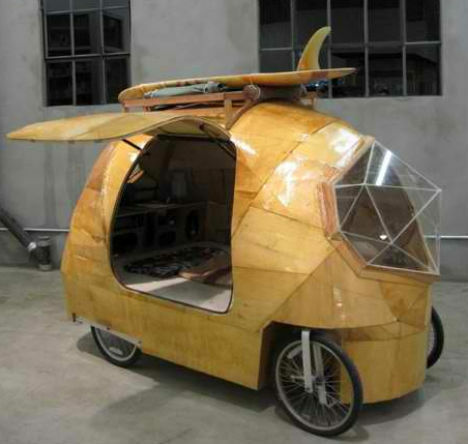 Made largely of fabric, Lehman B’s ‘Supertramp’ is relatively roomy and even contains a wood stove. 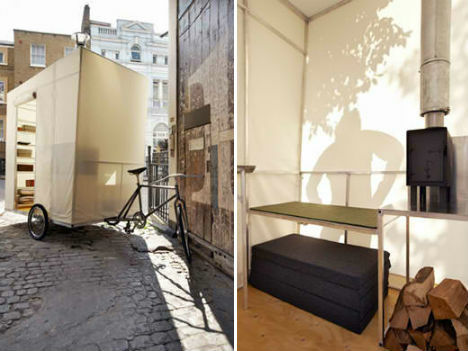 The designer took the bike around London in summer 2010, setting up near bars, restaurants, companies and galleries to inspire curiosity about living in tiny mobile spaces. Of course, the addition of an electric motor to pull a bike camper makes this particular creation a whole different beast, but it’s still impressive. The Golden Gate by Jay Nelson has an unusual geometric exterior made of fiberglass, plywood, glass and epoxy and incorporates bicycle wheels and other bike parts. It’s got a bed,a miniature kitchen with sink, stove and cooler, a toilet and storage space, but it won’t go more than 20 miles per hour, and only gets about 10 miles per charge. Nelson uses it for trips to the beach.